JOHNNYVETTE69 - Brian Enos's Forums... Maku mozo! What optic is everyone using for Carry Optics? CAN I USE A Beretta 92 G Elite IA BRIGADIER Slide ON MY 92FS ? some sentimental value 1st gun I bought would that modification keep the gun still within uspsa production since the slide was replaced ? I have 92fs 9mm with a fixed sight and with my old eyes paint doesn't cut it I've spoke about this in the past a recommendation of dove tailing the slide but my question is would I be able to use a brigadier slide instead seeing it has the dove tail in place already has any one tried this ? Thanks I kind of figured that was my only option . Can anyone recommend a good gunsmith my location is central New Jersey . 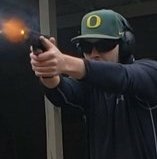 I am shooting production with a Beretta 92 Fs with a fixed front sight my old tired eyes have a tuff time picking it up. I've tried different fluorescent paints after a hundred round it dulls up any ideas? Thinking of up grading to a sti edge with a fiber optic sight tired of painting ! !